This month, we’ve got an amazing treat for all of you cat lovers (and we know that there’s lots of you out there). 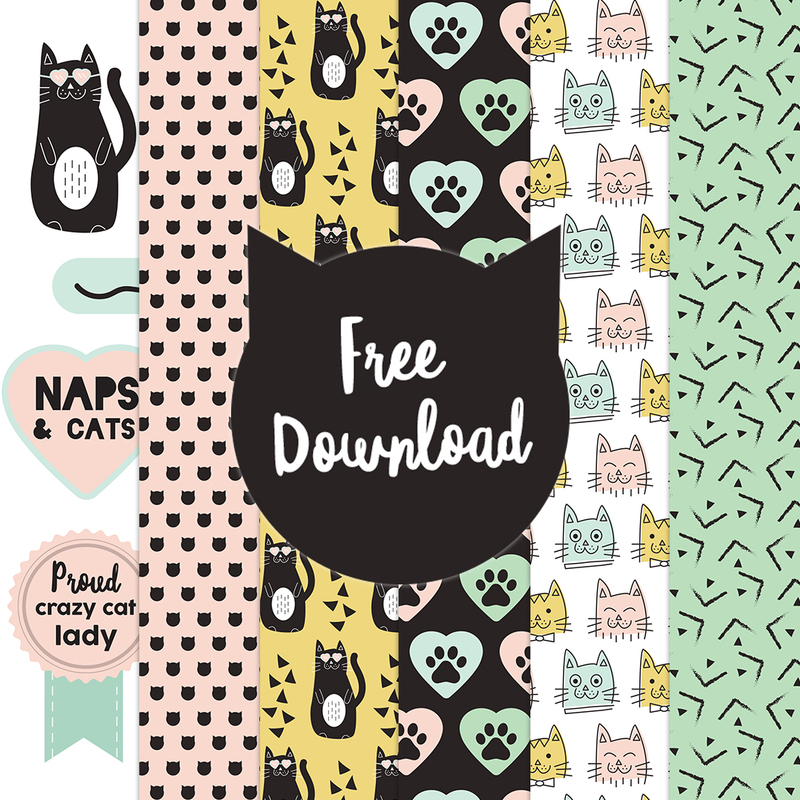 We’ve gone cat crazy for June’s free papers! Featuring adorable illustrations of kitties, paw prints, and fun patterns – as well as a selection of fun sentiment toppers – you can have so much fun using this purr-fect selection of six papers in your crafting. To download your set, click on the link below and print them off – all completely free! Download your free Cat-themed papers here! We’ve also got some great craft inspiration featuring some ideas for how you can use your free papers! Read on to find out how Maxine created a fun card, banner and cat treat holder! If you know someone who is crazy about cats, or you have the perfect crazy cat lady in mind when you look at these papers, why not create this super fun card for them? 1.Score your piece of A4 card at 3.5cm and 7cm on both sides. 2. Widthways, cut the piece of card along at 15cm. 3. Take the piece you have cut off and trim it to 6cm wide. This will make the front section of the card. 4. Cut different pieces of your free papers to cover the card inside, sides and the front section. 5. Adhere the front section to the bottom of the card, lining up the sides with the sides of the card. The card will fold flat to fit in a 6” x 6” envelope). 6. Cut out three of the cat toppers, the paw print heart, wool and “happy purrday” sentiment. Adhere these to the card to finish. (Back these onto a piece of card to add extra strength before cutting them out, if you like.) Your card is now complete. This would make the most purr-fect card to give to any cat lover! Make your kitty one of these easy DIY Cat Treat Holders with your free papers! This would make the perfect, unique gift for a cat lover (or even a cat if you know one that celebrates its birthday!) and it’s so simple to create using Dovecraft cardstock and your free papers. If you know (or yourself are) a proud crazy cat lady, then why not create this adorable triangle banner to display in your home, office, or craft room? It will definitely have the approval of your kitty! We upcycled an empty, clean sweet jar with some of the free papers to create an adorable treat jar for all of your kitty’s cat treats! What will you be creating with this set of papers? We’d LOVE to see so don’t forget to share your projects in the Inspiration area and to #Trimcraft when uploading to social media! Thanks sooo much for these free papers here. I must admit, I´m NOT a catperson, I´m much more into dogs, but I opfcause know people, who loves cats, so sure they´ll come in handy at some point, but I do love the first cardidea here though, so will definitely give that one a try, that´s for sure, and also have another idea it´ll be perfect for, I think.